There have been several key moments throughout the course of history that have changed the DJ landscape forever. We thought at Trackhunter it would be interesting to map out some of those moments that have taken place on turntable, CD and laptop. There are too many to mention, too many innovators and moments to capture, but here are six we think are some of the best and most important happenings that helped us get to where we are right now. 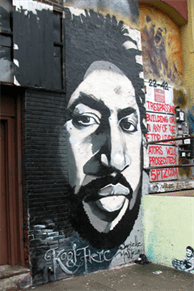 The Jamaican born Herc will always be remembered by many as the person who invented hip hop music somewhere in the Recreation Room at Sedgwick Avenue in the Bronx in 1973. He was a hard funk DJ who realised that whilst he played at block and house parties that groups of dancers would go that little bit crazier at certain parts of a track. These parts usually being the instrumental breakdowns or beat sections. Having a lot of tracks with such parts, he soon realised that he could do live re-edits or the breaks by playing two copies back to back on two turntables. Once the breaks became extended it allowed the dancers to get more into the groove and in time with the advent of breakdancing would create a suitable beat pattern for their floor moves. This created the term B Boys or Break Boys, taken from the breaks originally looped by Herc from duplicate copies of records he kept in his box. Over 40 years on, Herc's technique of spinning back to back tracks to capture a loop, lyric or sound is still integral to hip hop music and dance. Certain breakthroughs in history have happened by chance, take for example, the life-saving penicillin that was discovered after Sir Alexander Fleming left a messy workstation only to return to discover a strange bacteria on some of his cultures. This bacteria was in fact penicillin, all created by a simple error. Flash forward from a lab 1928 to the mid 1970s and the Bronx and the bedroom of Grand Wizzard Theodore. Although some sources dispute the timing and who actually came up with the first scratch, Theodore Livingston is widely claimed as that person. Like Fleming, Theodore stumbled on to his invention by accident. The story has it that he was in his bedroom playing music and at the time learning to be a DJ via his mentor and brother Mean Gene when the historic moment happened. Whilst playing music at high level his mother came into the room to ask him to turn the sound down. Whilst she lambasted the young DJ for his loudness, Theodore had stopped the record whilst in rotation and continued to move it backwards and forwards, in a scratching motion. Noticing a new sound, Theodore began to experiment with the concept of scratching and eventually showed off this new technique at a party. From there on scratching as an artform has continued to develop from the old belt driven turntables of the early 80s to now and the likes of Traktor and Serato DJ. It has become a true art form in its own right. Frankie Knuckles is synonymous with house music, he has been there from the start and another DJ on our list from the Bronx. Yet it was a few hundred miles away where Knuckles came to prominence just in time to catch with the wave of house music in the 1980s. Knuckles took up residency in the newly opened Warehouse Club in Chicago in 1977 where he played a mixture of disco classics, European rarities and independent soul. In 1982 Knuckles set out on his own path and started the Power Plant night in Chicago. The Godfather of House gained his name thanks to his successful residency at The Warehouse, a place that is widely acknowledged as to the birthplace of house music. A sound that, like hip hop and the other pioneers still resonates strongly today. One half of Jazzy Jeff and the Fresh Prince - AKA Will Smith - and the first real example of the transformer scratch appeared on their 1988 album; ‘He's the DJ, I'm the Rapper' and their track Live at Union Square. Recorded two years earlier, the explosive track eventually breaks into a series of cuts and scratches with the Fresh Prince building the hype. Then the transformer scratch drops, a sound where the record is cut back and forth with a fast finger, crab like action on the crossfader, making the sound break into tiny rhythmic pieces. The scratch is still very much used nearly 3 decades later, and like Theodore, Jeff secured his place in the scratch DJ Hall of Fame. Since the acid house scene of the late 80s, dance music had been increasingly gaining importance at large established festivals like Glastonbury. In 1994 festival goers were treated to a live set by Orbital on the NME Stage, it was only a matter of time before Michael Eavis would put part of his land aside for dance fanatics. It happened a year later and the Glastonbury Dance Tent was opened with a mixture of joy and annoyance. Many festival goers saw Glastonbury as a traditional arts and music festival, with a mainstay of guitar and world music artists, not lowered to the level of four on the floor beats. 20 years on from this, attitudes have changed, not just at Glastonbury, but in general to dance music, that it is here to stay in whatever genres. Carl Cox took to the stage in that first year, a fitting headliner for an inaugural weekend of electronic music. Since day one, the dance tent has remained incredibly popular and has added extra credibility to the festival. It has shown other festivals that dance music deserves a place in a tent, or field, after all the rave scene was built on that idea. Perhaps not the first example of a DJ using Ableton, but considering it was broadcast on Radio One's essential Mix in 2005 that it brought about a new era for DJs. At that time vinyl was still popular but CD was now the dominant format and the fresher digital front was well on the horizon. Sasha's set showed the full potential of what you could with the new digital technology. Sasha was already renowned for being a skillful DJ and excellent curator of mixes, but his Ableton set pushed DJing onto another level. Given we are ten years on the and the technology has moved on somewhat, you would be hard pushed to find a mix as well polished and put together as this one. Sasha was able to spot the full potential of these new technologies and with it push the envelope a bit more.